Should I make my custom field a category or an attribute? The only required field to complete is the name of the event. 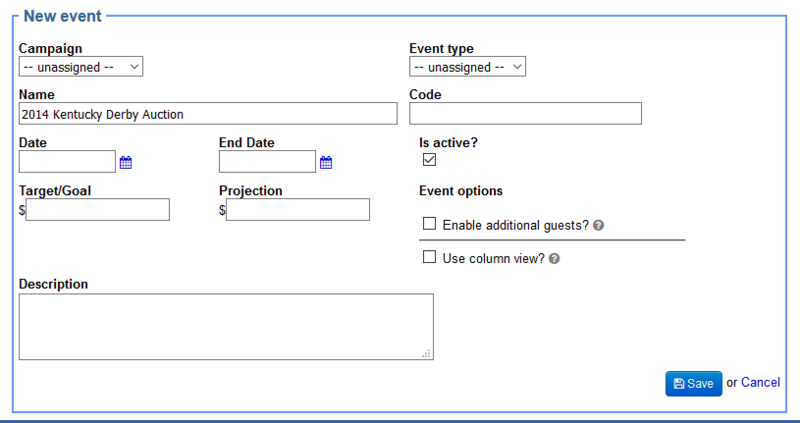 You can choose to assign the event to an existing campaign and add start and end dates, an event type such as auction or performance, a specific target or goal for the event, as well as a projection and a description. By default, the Is Active button is checked, allowing you to add gifts to this event when entering them in the gift screen. If you have a revenue goal, add it to watch progress on the event dashboard. The dashboard will be updated in real time as you enter new gifts. Add a date: Your most recent events will show at the top of the Events page. When you add a constituent to an event in LGL, an invitation is created for them. That invitation allows you to track their event segment (if applicable), RSVP status, Attendance, Attendee Count, Guest names, and any custom fields you add. 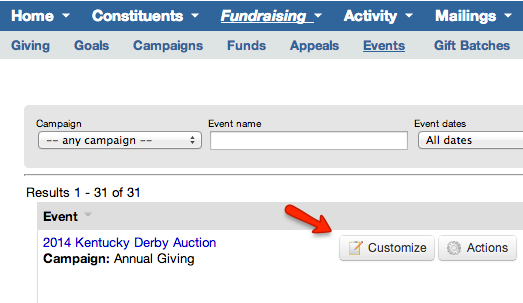 Constituents can be added to an event in one of three ways: Individually from their constituent record, in bulk from within the event, or when entering a gift from the gift record. 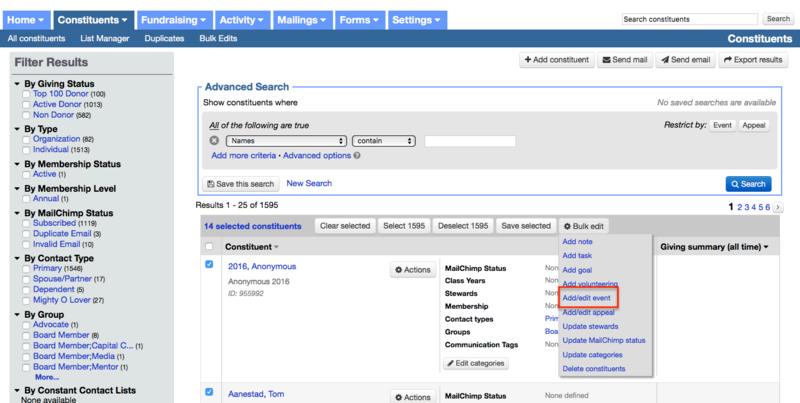 To add a constituent to an event from their constituent record, first search for the constituent you wish to invite in the Search Constituent field. Choose the Actions button next to the constituent name, then select Add to event. Note: You can also do this from a constituent’s individual record by going to the Related Activity section at the bottom of the page and clicking the More actions button. Once you select Add to event, you can select the event that you want to invite the constituent to and complete any other applicable fields in the New Invitation screen. Once you’ve saved the invitation, the constituent will be added to the event and a copy of the invitation will be stored in the constituent details page in the Related Activity section. 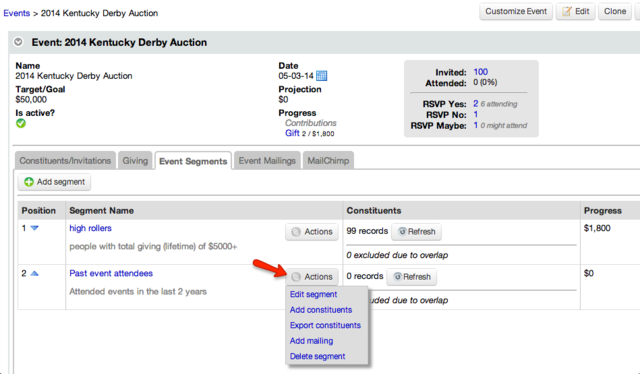 You can add constituents to your event either individually or in bulk. 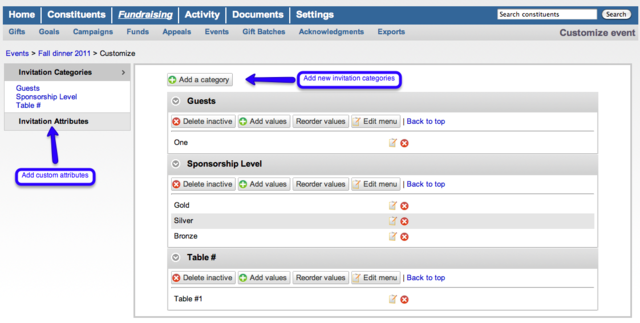 Once you’ve created an event, click on the name of the event from the Events dashboard to see the details page. 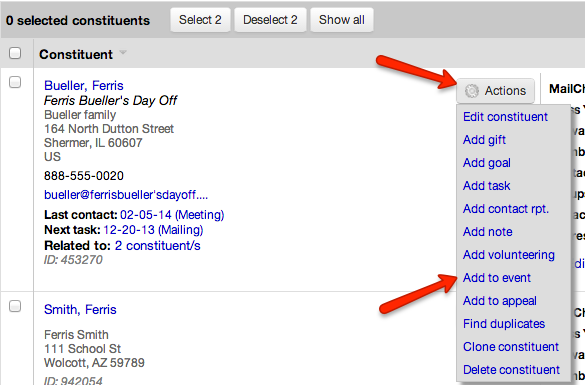 In the Constituents/Invitations tab, you can select the Add Constituents button to add multiple constituents or click the Add 1 constituent button to add one constituent at a time. Constituents can also be added to an event through segments. To add segments, click on Event Segments in the Event navigation bar. Then choose Add Segment to name the segment, add a description, then click Save. Read about the options in this article. You can add custom categories and attributes to your event so that you can easily track things like sponsorship levels, table assignments, meal preferences, and more. 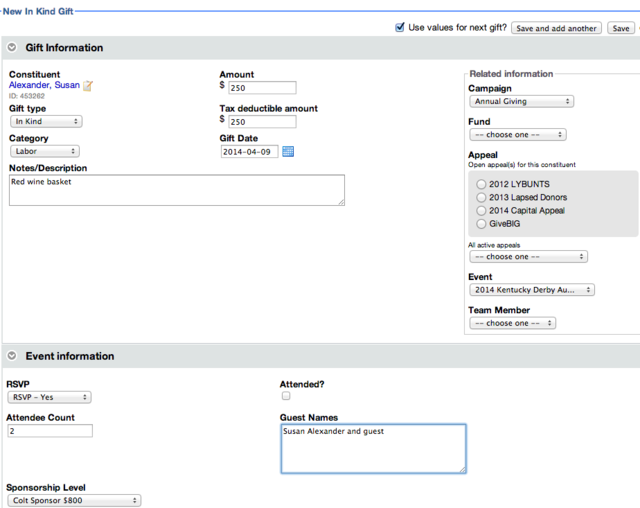 Within the event feature in LGL, you can add as many custom fields to the invitation as you like. If you choose to add the field as a category, you will have the ability to name the category and provide a listing of values for that category. When setting up an attribute, you have a few options: You can make it applicable to individual or organization type records, make it read-only, or cause it to be searchable. Gifts of all types (outright gifts, pledges, in-kind gifts, and other income) can be attributed to an event. You can choose to add a gift to an event invitation or via the Gift entry screen. With either option, all event invitation fields (both the default and any custom fields you may have added) can be updated when entering the gift information. If you do an upload via the Flex Importer of gifts associated with the event, make sure you use the field "Gift Event Name" to signify to LGL that the gift should be associated with the event. Additionally, if you want to associate the constituents in your upload with the event or an event segment (i.e., if they aren't already in your list of event constituents), use either the "Gen. Event Name" or "Event Segment Name" fields. 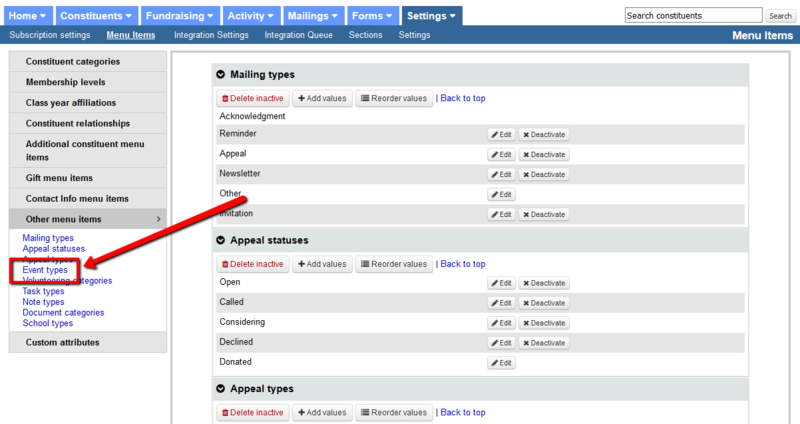 Click on the Export results button in the Constituents/Invitation tab in the event. Choose the report template you’d like to use (“Event Invitations” might be a good starting point). Then make any changes you’d like, preview, and save. For more on exporting data from an event, please read our Knowledge Base article on exporting event information.